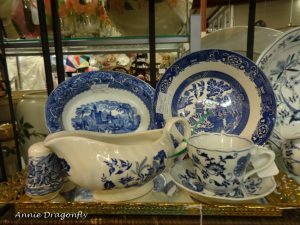 Transferware is the term given to pottery that has had a pattern applied by transferring the print from a copper plate to a specially sized paper and finally to the pottery body. While produced primarily on earthenware, transfer prints are also found on ironstone, porcelain and bone china. Ultimately, many thousands of patterns were produced on tens of millions of pieces. The process was developed in the second half of the 18th century in response to the need of the newly emerging British middle class for less expensive tableware. Many factories claim responsibility for the origin of the process, but, in fact, it was probably a combination of men and materials that came together in the English county of Staffordshire, where there had been pottery making since the 16th century. 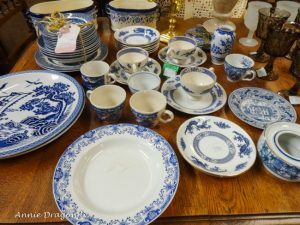 A combination of raw materials, men of science such as Spode and Wedgwood, cheap labor and new canals that connected Staffordshire to the major ports of Liverpool and London, made the transferware production possible and profitable. 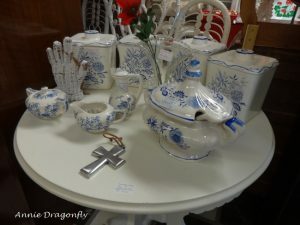 At first, the transfer patterns were copied from the blue and white Chinese designs found on the hand-painted porcelain that was popular in the 18th century. 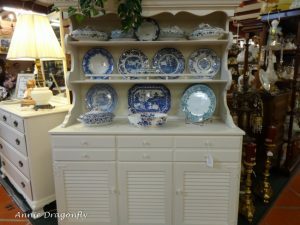 At the turn of the 19th century, while potters were still using Chinese patterns as their primary source for inspiration, they began to incorporate European features into these designs. By the 1820s, arguably the golden age of transfer printed pottery, the number of potteries grew and thousands of patterns were printed to tempt any available market. The English may have lost the War of 1812, but their potters were ready to sell pottery with patterns lauding the new American nation to the American market. Important buildings, landscapes and war heroes are just a few of the patterns that appealed to Americans. 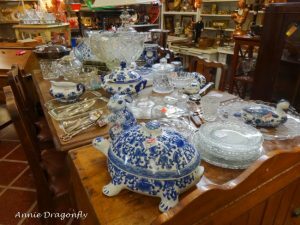 There were many foreign markets, as well as the home market, to keep the potters busy. The new technology, fueled by the Industrial Revolution, made Staffordshire the center for pottery making and development for more than 200 years. 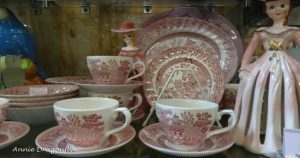 Although it has been estimated that approximately 90 per cent of British transferware was manufactured in Staffordshire, other areas of Great Britain such as Leeds, Liverpool, Swansea and Scotland were also producing transferware patterns for the mass market. It is only since the 1990s that the pottery industry has mainly moved its production off shore and out of Great Britain.